Condition: ISOCUTE Brand New & High quality. 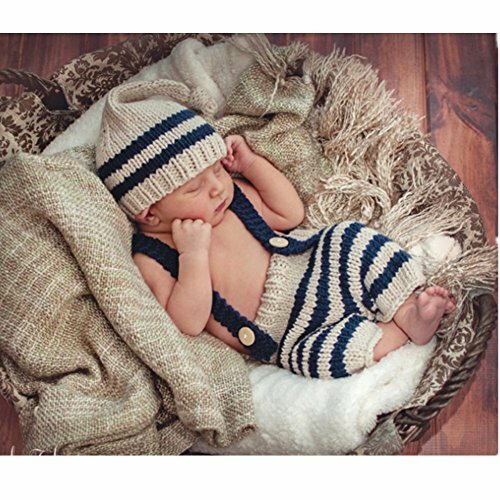 Item Type: Unisex Baby Photography Costume. Package Including: 1PC baby hat + shorts + carrot. UNIQUE DESIGN: Pure hand-made baby bunny costume set to achieve a more vivid and cute look, make your baby more lovely and beautiful. Whether you collect or give gifts is very special. SIZE: Suitable for about 0-3 months unisex baby (For Reference Only). Because of hand-crochet, the size of each costume will be biased, please kindly understanding. MATERIAL: Soft and Comfortable knitting yarn is more safe and will decrease the chance of trichosissensitiva. 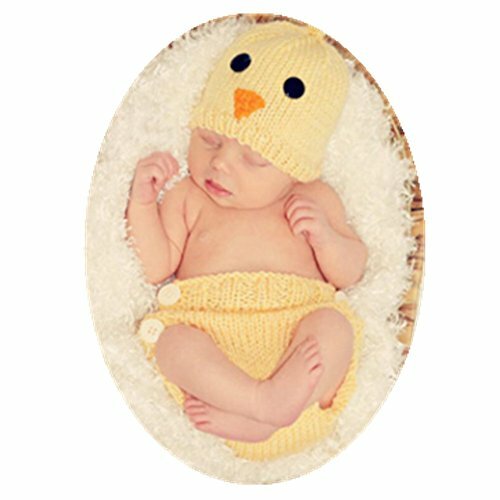 Your best choice for New born first pictures, Easter and baby shower gifts. 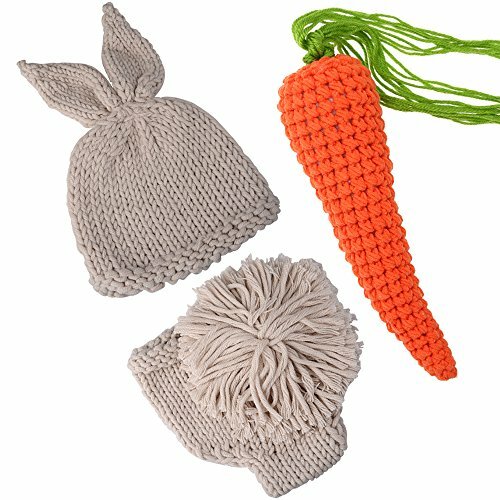 QUANTITY: 1PC Crochet knitted baby hat + shorts + carrot. 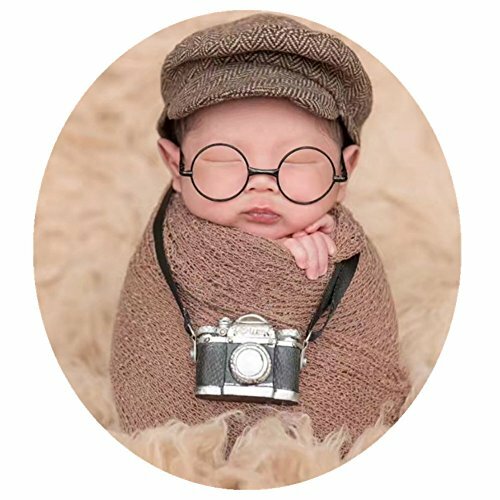 ISOCUTE Brand: A infant clothing company focus on designing, producing and selling fashion baby photo shoot props for every cute newborn baby. Any questions, please contact us first, we will be responsible for anything we sell. Wearing fantasy, embracing beautiful childhood, FYMNSI helps you record every happy and memorable birthday of your baby. The size details below is just for your reference. Please allow 1-3cm differences due to manual measurement. Hand wash in cold water, line dry, do not bleach and iron. Color Disclaimer: Due to monitor settings and monitor pixel definitions, we cannot ensure that the color you see on your screen as an exact color of the product. We offer every customer a superior customer service, please send us e-mails directly if any questions or concerns. JUST ENJOY YOUR SHOPPING HERE @ FYMNSI. 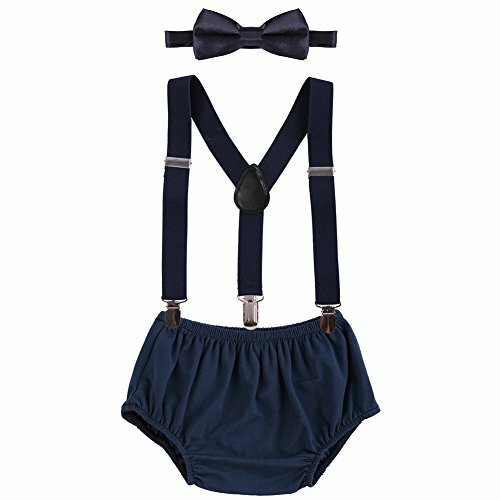 Stylish and lovely newborn infant baby boys 1st/2nd birthday party cake smash costume, "ONE" or "TWO "letter print bloomer shorts with elastic Y-back clip-on mini polka dots suspenders bow tie and ear headband 4pcs outfits. 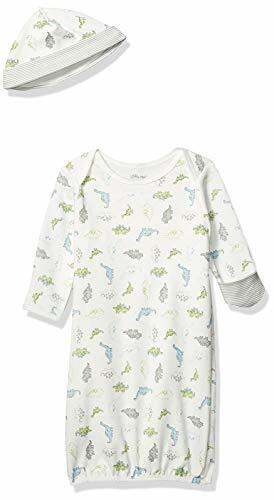 Material: Cotton + Polyester + Metal, breathable and soft to the touch, special fabrics to protect your baby's tender and lovely skin, very comfortable to wear. Y-back clip-on suspenders style, designed with 3 clips and 2 length adjusters, brace pants perfectly, no more falling pants! Unique bloomer with pattern print and design, matching with gentleman bow tie and mouse headband, adorable and fashionable. Machine washable, enjoy all the fun and get it messy with cake. 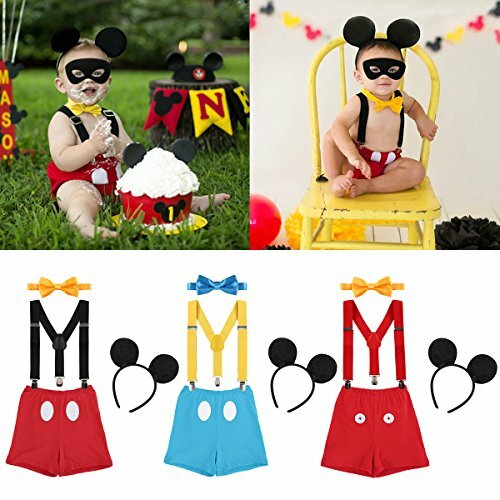 Perfect as 1st birthday, 2nd birthday, Mickey birthday party, cake smash, carnival, wedding party and photo shoot costume, Halloween, Christmas, festival, or daily wear etc. 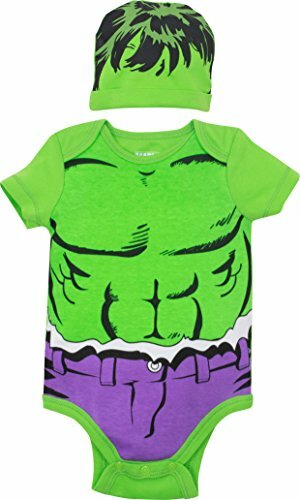 Suitable for baby boy 6-24 Months. Your baby would receive a lot of compliments and be the most handsome baby in his birthday cake smash party. Care Instructions Hand wash in cold water, line dry, do not bleach and iron. VERY IMPORTANT: Please supervise children wearing the bow tie at all times. There are small parts that contains choking hazard. 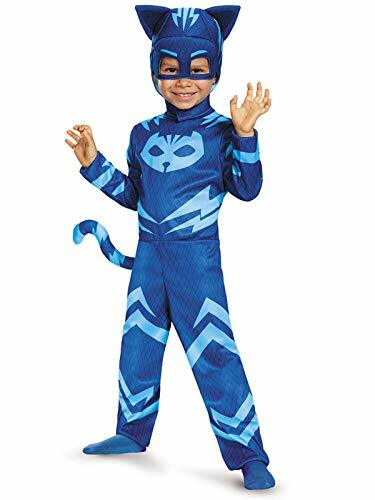 FEATURE:Animal design,Suit for Daily Pajamas,Outwear Outfit,Halloween Day,Thanksgiving Day and Christmas Day,Gift giving,Cosplay Party. 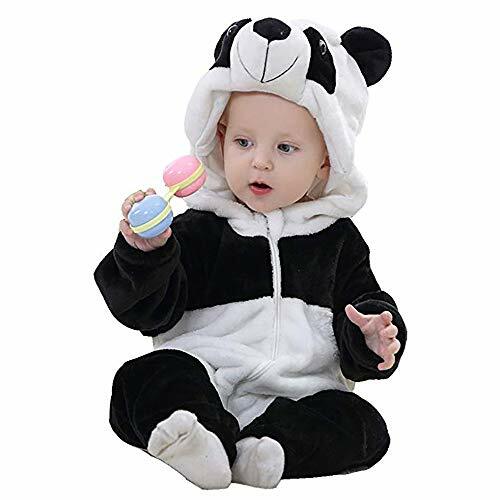 Colorful and Fun Prints newborn baby romper.Panda, Stitch,Rabbit ,Minions, Santa Pikachu Clown fish Elk Elephant Fabric features.Choose high-quality fabrics, the texture is thick, soft, wear comfortable, make the clothes more layer sense. 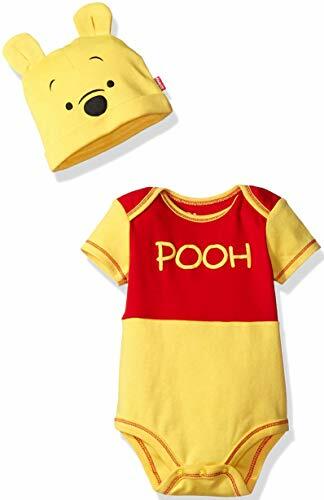 RECOMMEND:Cuddly animal design.The baby onesie not only fit for daily dress and festivals,but also Is a great gift for your baby. Gown has soft elastic at bottom to keep baby cozy and make changes easy; fold-over mitts prevent self-scratching. Gown comes with matching hat for extra warmth. -Outfits Set Include: 1pc hat and 1pc pants -SUITABLE:Suggested 0-3 months baby wear(For Reference Only) - MULTIFUNCTION: Perfect for memorable photography shoots, baby shower gift, and presents,Super Soft, Comfortable and Breathable -Make your baby become more fashionable,attractive,beautiful,your kids will like it very much. Newborn Party Costume, Baby Photography Prop, Baby Photo Prop, Perfect for newborn party costume. This baby Photography Photo Props set is 100% handmade. -Color: same as picture but pls note the actual colors may slightly vary from the pictures due to the different monitor settings and light environment when photos were shot. -Make your baby become more fashionable,attractive,beautiful,your kids will like it very much. Newborn Party Costume, Baby Photography Prop, Baby Photo Prop, Perfect for newborn party costume. This baby Photography Photo Props set is 100% handmade. -Color: same as picture but pls note the actual colors may slightly vary from the pictures due to the different monitor settings and light environment when photos were shot. -Outfits Set Include: 1pc hat +1pc Wrap cloth.Wrap cloth Size:40CM Wide by150CM Long. -SUITABLE:Suggested 0-2 months baby wear(For Reference Only) - MULTIFUNCTION: Perfect for memorable photography shoots, baby shower gift, and presents,Super Soft, Comfortable and Breathable -Make your baby become more fashionable,attractive,beautiful,your kids will like it very much. Newborn Party Costume, Baby Photography Prop, Baby Photo Prop, Perfect for newborn party costume. This baby Photography Photo Props set is 100% handmade. -Color: same as picture but pls note the actual colors may slightly vary from the pictures due to the different monitor settings and light environment when photos were shot. -Outfits Set Include: 1pc hat +1pc Wrap cloth.Wrap cloth Size:40CM Wide by150CM Long.